Sharing a passion for performance on period instruments, these three graduates from the Lyon CNSMD were naturally attracted to the format of the string trio, and its rich, though lesser-known repertoire. 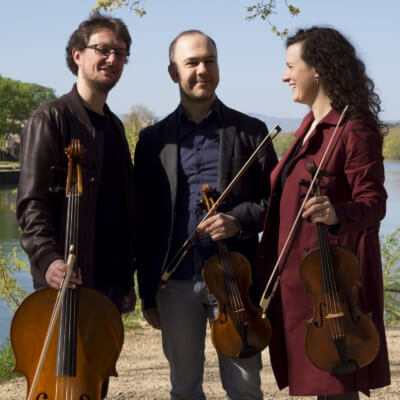 The ensemble Trio Guersan is focused on a new approach of the works from the classic and the romantic periods. Trained at the Lyon CNSMD, Mathieu Schmaltz obtains his MA in 2000, then further his studies in Cologne and London. He is a prize winner of Mécénat Musical Société Générale and of the Postacchini International Violin Competition. A member of the Orchestre de Chambre de Toulouse for six years, he now performs within various ensembles, participates in a number of projects and festivals, both in France and abroad. Perfecting his skills in the practice of historical instruments, he teaches violin at the Brignais Ecole de Musique (69). Trained at the Lyon CNSMD, then at the Geneva HEM, Aurélie Métivier owns both an MA in music performance, for viola, and an MA in the practice of historical instruments, and also a BA in musicology. Equally interested in the repertoire of Early music and contemporary works, she is a full member or guest artist of a number of chamber music ensembles and symphony orchestras. She has performed under renowned conductors, whether at numerous festivals or with various ensembles of which she is part. She is a teacher at the Conservatory of Rive-de-Gier (42). After cello studies at the Lyon CRR, Jean-Baptiste Valfré turns to Early music. In 2010, he obtains an MA in baroque cello, with first class honours, at the Lyon CNSMD, then perfects his interpretation of the classical and romantic repertoires performed with period instruments. He has had the opportunity to play under prestigious conductors and is a regular guest of a number of renowned ensembles. He teaches at the Conservatory of the Provinois (77).